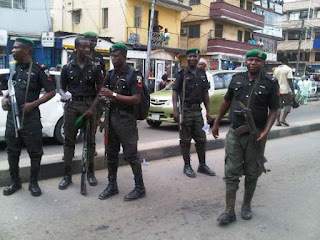 An unnamed teacher alleged to be part of a 4 man robbery gang that operated along Goldie-Mount Zion in Calabar was shot and killed by the Police. Somebody called the police about the gang and the police, in turn, responded to the distress call that the robbers were harassing owners of shops. Agents from the Uwanse Police Division showed up at the location and were engaged in a gun duel. The getaway driver and another suspect escaped whilst the teacher was killed and another gang member captured injured. Among the items recovered were 2 locally-made pistols and phones, laptops and money. Mrs. Sarah Bepeh, a witness, identified the only suspect that was killed as a teacher in her daughter’s school. Ephraim Chigozie, said he was among those robbed at gunpoint. Before I knew it, they held one of my boys. I did not know that their leader was holding a pistol. As I tried to walk towards my vehicle, he ordered me back into the store and asked me to lie flat on the floor. They dispossessed us of our money and other valuables before heading for a nearby microfinance bank. Unfortunately for them, the bank is usually crowded with market women who always go there for loans. They entered the bank and discovered that the crowd was much. They ordered everyone to lie down, but the women started screaming. They had to leave immediately. Some people alerted the police,” he said. “Our men killed one of them during a gun duel. One was injured, while two others are still at large. An investigation is ongoing. We recovered cash, two locally-made pistols, laptops and phones from them. We will surely get to the root of the matter,” she said.